August Garden Hackle is up. public beach north of here to fly fish for Pinks. 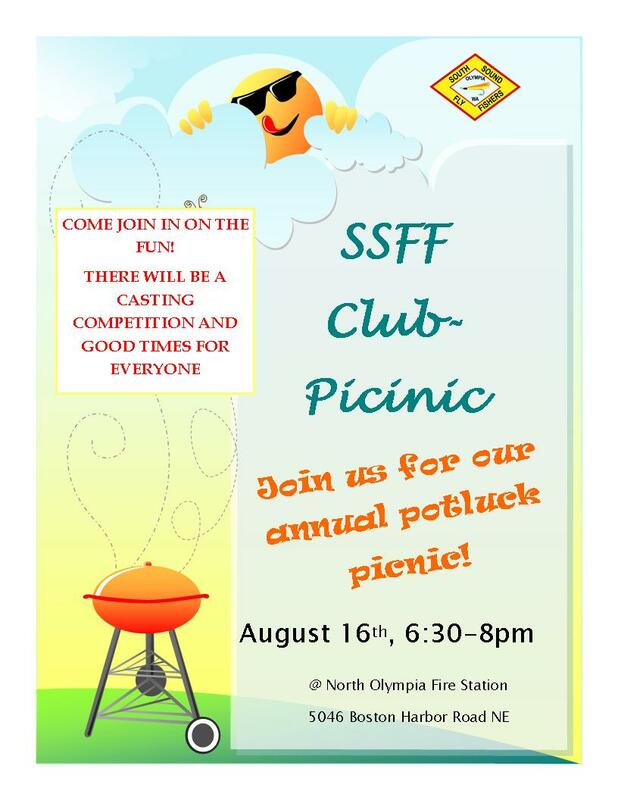 up in the Tacoma area. If you are interested in participating in this outing please let me know. during the week of October 10th. This evening class will run for 4 weeks and will probably be from 6 to 8 p.m.
between $50 and $60 and will include all tying supplies. meeting but expect the class will be full by that time. taught in this class let we know so I can pass it on to Janet. tragic event while participating in the sport. situations I was not prepared for what occurred a very short time ago. services of a guide when water levels are high and my wife chooses to join me. the weather in fact it was a very pleasant sunny day of about 60 and no wind to speak of. was one of the reasons we chose to float this section. 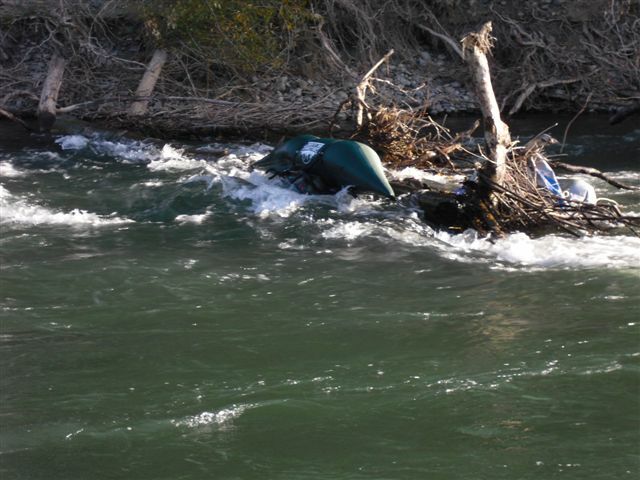 to call one of the local fly shops to inquire about the sign and what to expect on the water. yards back rigging his gear. the current seam from the sharp turn off the left bank and the one I was in on the right. right side of the downed tree. out? I’m on the wrong side of the river and no way to get to him quickly. better. I ran back to my boat looked for a way to get across and back to him safely. slid down over the bank and reached out to him with the branch that I had found earlier. things went wrong yet so many thing s went right for us and our families. my next journey to one of my favorite rivers. Wade and float fishing safety? What do you carry on your person? What do you carry on your pontoon boat? Do you wear a life jacket ( one that maintains head in upright position—self inflating etc? Do you even carry a life jacket? Do you have a lunch bag or equipment bag on board? Do you carry a net? Do you carry an anchor--mooring (line)? Do you carry a knife (serrated-standard)? Do you carry an extra rod? Do you carry a cell phone? Do you carry a camera (lanyard)? Do you use a wading staff? You wear waders and boots ( lace ups or wired ) wader belt, sun glasses (croakees)? What type of hat do you wear (ball cap or one with chin strap)? What about your gear vest and jacket ( what do you carry in and on them)? Does your pet come along on your boat? cold water or severe conditions? It’s August, and it’s an odd year. If you haven’t been in a coma for the past few months, you have undoubtedly heard about the massive horde of pink salmon swimming our way. Pinks have a reputation for being aggressive, and therefore take a fly easily. With that said, fly selection can sometimes be trivial. In most cases, when we select a fly for returning salmon, it is a matter of function and color, rather than shape or representing a food source. Some would even argue that color may be less important as well. 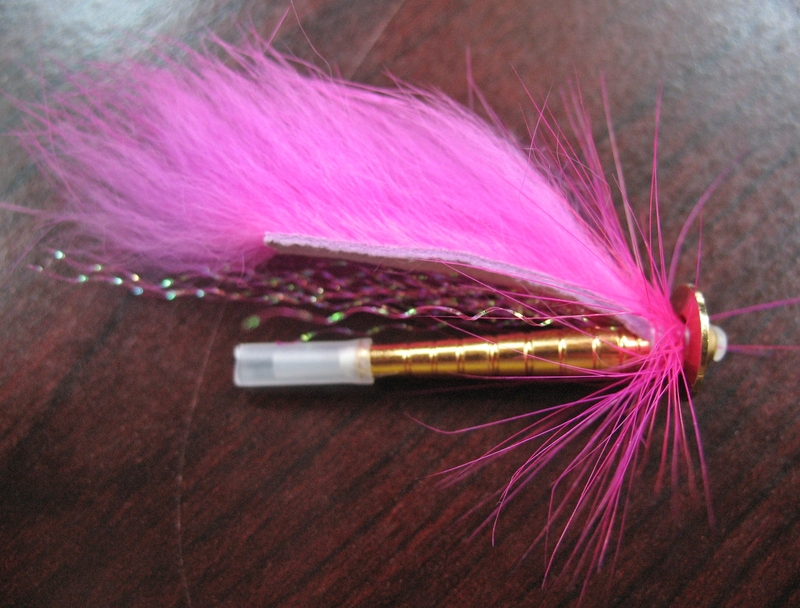 Most people you talk to say that pink is the color you want to fish when you are fishing for returning pink salmon, so we will go with that. Next you want a fly that will go to where the fish are and will have enough action to entice a “bite”. There are many choices, in fact it is easy enough to whip up your own creation on the vice, and it will certainly do fine. But, if your creative juices aren’t flowing, try tying a few of these. 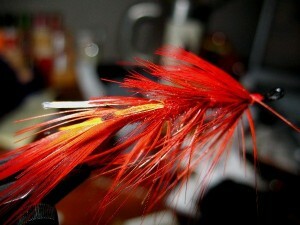 This is the Guide fly from the Fly of the Month Article back in May of 2010. This pattern is great out in the salt for Cutthroat, but it is modified here with all pink, and a brass tube to get down a little deeper. The fly itself is very simple. 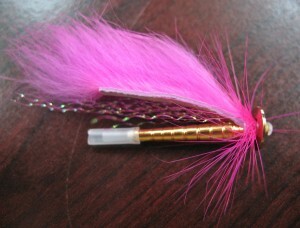 A little crystal flash, a piece of bunny strip and a couple of wraps of saddle hackle. What makes this fly unique is the monster cone for the head. The head creates turbulence behind the fly and causes the bunny strip to wiggle like crazy when being stripped in. If this doesn’t piss off a nearby salmon, nothing will! 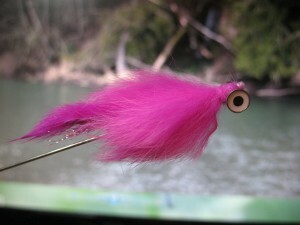 Another choice for pinks could be a pink bunny, find the “how to” in the September 2010 fly of the month article.